Our passage contains the dreadful consequence of a “party spirit” (politics) operating in the churches of God. Ignoring this passage has brought many Christians, relationships, ministries, and moves of God, to an abrupt and pitiful end over the last 2000 years. It is impossible to overstate how dangerous a “party spirit” or politics are to God’s people. This is why Jesus commanded the disciples not to organize their ministry into a Gentile power structure in Matthew 20:25-26, Mark 10:42-43, and Luke 22:25-26. Multitudes cry to Heaven “Lord, Lord” and then go right out and disobey these clear verses. Simply put, Jesus warned us not to set up a corporate type hierarchy (pecking order, ranking, chain of command) in the churches. Despite this clear command being repeated in all the synoptic Gospels, churches and organizations are typically set up like a corporation. In a corporate hierarchy, we might say that “Pete is about six levels below the CEO;” however, this is not the way churches and Christian organizations are to be established. It is nothing more than Israel crying for a king rather than allowing God to rule over them. As with Israel, so too with the churches, this Gentile, worldly, Egyptian, or whatever adjective we want to employ, “power structure” has grave consequences. Any place that you find a ranking system, you have sin being committed. Disobeying God in Matthew 20:25-26, Mark 10:42-43, and Luke 22:25-26 is no different than any place else. Moreover, ranking systems breed sin and offenses. They can do no other. Why? Because when there is a political element involved, people don’t feel obligated to treat their brother or sister in Christ as they would want to be treated. They generally lose their minds and forget they are supposed to be Christians. In the Old Testament, when the people were really off track, God would use the prophets to bring a strong message of correction. Nobody “votes in” a prophet, so God has to raise one up to confront the people. They often employed radical language or tactics to accomplish the job. Similarly, Paul used a morbid statement to the Galatians, But if you bite and devour one another, beware lest you be consumed by one another! What happens? When someone bites, the natural response is to bite back. This process continues until all parties involved are consumed (destroyed). What begins as behavior becoming toddlers — erupts into a savage warfare between people acting like wild animals. The renowned Greek scholar A.T. Robertson, in commenting on these verses, tells the sobering story of two snakes who each swallowed the other by the tail. If there is one thing that most parents of toddlers detest — it is biting. The fastest way to receive a spanking when I was a child was to bite somebody. Emotions would run so high that some parents would say to the victim, “Just bite him back! Show him how it feels.” It would not be unusual for parents to come to blows nearly when they looked at their child’s arm and there was a bite mark. “Why did he bite you? !” The parent asks. “Because I was playing with his toy.” Then the parents get into an argument. One backs their child’s right to territory, and the other wants an apology for biting. In modern times, I suspect parents are more civilized than this, but I’m not holding my breath. Toddlers are not the only people who “bite” when they don’t get their way. Adults do it too. This is what Paul said, But if you bite and devour one another, beware lest you be consumed by one another! (Galatians 5:15) This is much more serious and destructive than the behavior of toddlers. It is more serious because toddlers are supposed to be selfish; that is to say, they have to be taught to be friendly and loving. Christian adults should know better. It is more destructive because there is so much more at stake. When a toddler bites and is then bitten back, both have bite marks. Each tells how the other bit them. The same holds true with adults. Of course, we are not speaking of literal teeth marks; we are dealing with malicious actions against one another. When adults grow up in carnality they don’t fight over toys, they fight over territory. They fight over positions at work or at church. Most of the time the parties fight each other until neither of them have a reputation left. In fact, people will even sabotage one another in hopes they can “get their job.” This is part of what is often called, “office politics.” Whole books have been written about the subject. What happens? Life becomes a perpetual replay of age 2-20. Everything we had to endure from pre-school to High School becomes our daily lot. Boys fist-fighting in the halls; girls quarreling and fussing. I realize the fists are not usually literal in adulthood, but the attitude back of those behaviors is just as real. The stress on daily life for some becomes almost unbearable. These things ought not so to be in the churches of God; but unfortunately they are. There is nothing new under the sun. Nepotism is just as rife in many churches as it is in the world. Ministries become dynasties all the way from the corner church to the largest Christian TV Networks. Father and son feuds develop imitating the madness and hate of family based reality shows like Orange County Choppers. 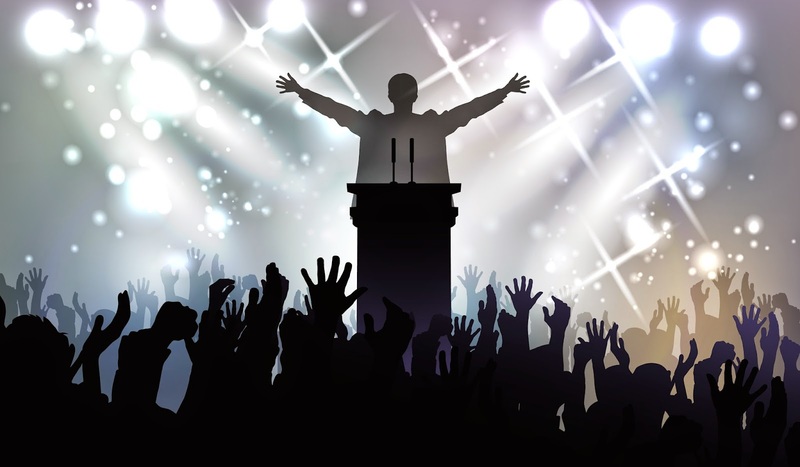 Moreover, politics are often exaggerated in churches. Factions develop that split churches and organizations into two or more opposing camps. Again, usually there is a real spiritual reason for doing it, just like there was a real good reason for the toddler to bite the other one. Really? Satan was the very first politician. He led a rebellion in Heaven and drew a third of the Stars with him. Then he shows up in the Garden of Eden spouting propaganda to win over the whole human race into his camp. First politician. First liar. Hmmm. See the connection? Satan misrepresented God because he wanted his place on the throne. Nearly all politicians misrepresent their opponent or withhold information about them that would sway the people into liking them. “Make the opponent look bad” is the modus operandi (m.o.). Imagine what happens when a Christian environment becomes “politicized.” Who do you think is behind it all? God wants the churches to be a place of heaven on earth. Satan does too. He comes in to use people to do on earth what he had done in Heaven. He divided it by campaigning for God’s throne. All the while blinding everyone to what he is doing. What happens? He causes so much strife that every action gets interpreted. Motivations get questioned. A spirit of suspicion prevails. Most of the time people are just trying to serve God, but sometimes they are not. People know when they are intentionally being divisive. Whereas love puts the best construction on events, politics puts the worst construction on them. Ministers have been known to hire private detectives to bring one another down. It happened in the 80’s and early 90’s in mainstream evangelicalism. The name of God was blasphemed among the Gentiles. There is no new thing under the sun. Pride has often destroyed the works of God’s hands. How is God going to handle those who do such things? It’s a sad thing to work in the kingdom for decades only to have those labors destroyed by a bunch of crooked politics. Pride has been known to completely destroy ministries. Men have turned and fought against the very thing they prayed into existence. In America we have what some have called a “peaceful transfer of power” when new presidents and governors are elected. Harry Truman had the right attitude when it came to leaders leaving their political office. For example, he was asked during the Cuban Missile crisis if he had called the sitting president to offer advice. His answer was compelling, “If the president wants my opinion he will ask for it. And when he does I won’t be telling you about it. If the president wants it known he can tell you.” This is humility talking. This is a man who was able to “let go” and go home. He wanted the nation to prosper, even though he handed the presidency over to a Republican rival. Understand that Truman is considered to be one of the greatest presidents in American history, and yet was not offended by the fact that he may not have been consulted by the sitting president, even in a crisis. Is this the attitude of politics in ministry? Not generally. If you don’t keep everyone feeling important, they are liable to start biting and devouring. Is there any wonder Jesus commanded the churches not to set up in a worldly construct? Politics has no place in the Kingdom of God; it is the outworking of democracy, not kingdom. What’s the use of so much prayer, when politics are destroying our prayers? Why fast? Everything in the kingdom of God is put at risk where politics are involved. How can we have a revival if people are jockeying for the credit and glory for what transpires? I have seen revivals destroyed because of rivalry. What happens? Christians are disillusioned and near to giving up because of the politics that go in behind the scenes. This is where repentance has to begin. Not in the pew; not with the drug addict; not with the sinners around the world. We cannot go forward until men and women lay down their ambitions and all that is involved in them. There must be a humble repentance of the secular approach to ministry that prevails in our times. There must be a wholesale repentance of lovelessness and hate wherever it exists among leaders in the churches of God.